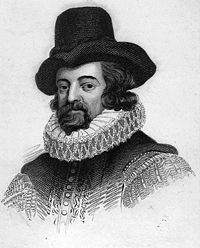 [at the end of the section on Gassendi] There is one name which, in reputation, occupies a pre-eminent position in philosophy, belonging to this period - Francis Bacon. But, for ourselves, for whom true ethical and humanitarian principles have a much deeper significance than mere mental force undirected to the highest aims of truth and of justice, the name of the modern assertor of the truths of Vegetarianism will challenge greater reverence than even that of the author of the New Instrument. That Bacon should exhibit himself in the character of an advocate of the rights of the lower races is hardly to be expected from the selfish and unscrupulous promoter of his own private interests at the expense at once of common gratitude and common feeling. His remarks on Vivisection (where he quesions whether esperiments on human beings are defensible, and suggests the limitation of scientific torture to the non-human races) (1) are, in fact, sufficient evidence of his indifferentism to so unselfish an object as the advocacy of the claims of our defenceless dependants. When we consider his unusual sagacity in exposing the absurd quasi-scientific methods of his predecessors, and of the prevailing (so-called) philosophical system and the many profound remarks to be found in his writings, it must be added that we are reluctantly compelled to believe that the opnions elsewhere which he publishes inconsistent with those principles were inspired by that notorious servility and courtiership by which he flattered the absurd and pedantic dogmatism of one of the most contemptible of kings. "Medicine has been more professed than laboured, and more laboured than advanced; rather circular than progressive; for I find great repetition, and but little new matter in the writers of Physic."
. . . . . . . . . We count not worth the hanging - but some human." Advancement of Learning. viii., 2.